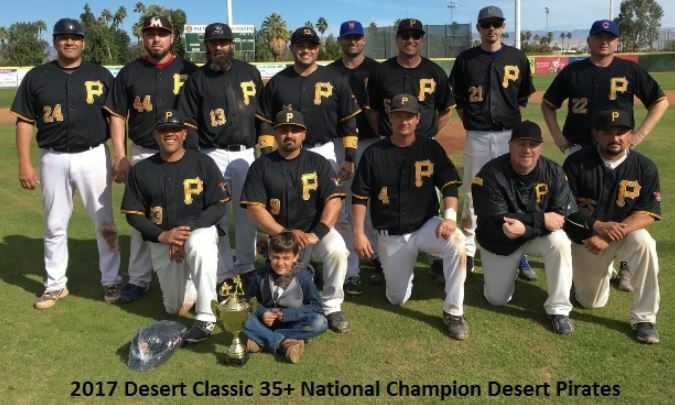 January 16, 2017, Palm Springs Stadium – Led by a four run eighth inning rally the Desert Pirates defeated the Montebello Angels 8-4 to win the 35 National Division at the MSBL Desert Classic tournament in Palm Springs. The Pirates started quickly by scoring four runs in the first inning. However the Angels responded with three of their own in the bottom half of the inning on a three-run double by Ken Lumpkin. The score remained 4-3 until the bottom of the sixth when Lupe Catalon led off the inning for the Angels with a triple and then came around to score the tying run on a throwing error. In the top of the eighth the Pirates scored four runs to retake the lead 8-4 and unfortunately the Angels were unable to mount any kind of rally in the last two innings as they fell to the Pirates. For the Angels, Castalon went 3 for 4 with two runs scored and an RBI and Lumpkin went 1 for 3 with the three-run double in the first inning.